A honeymoon in the Greek islands is always a good idea. The perfect climate, whitewashed buildings and endless Aegean blues from the perfect romantic backdrop. Greece’s most prestigious islands, Mykonos and Santorini, are especially popular honeymoon destinations. The minimalist Cycladic style is a high point in modern design. It embodies the unpretentious luxury people associate with the best hotels on the Greek islands. Many of the hotels are designed with romance in mind, but it can be tricky deciding which hotel is best for your honeymoon. Do you want uninterrupted caldera views in Santorini, a sprawling Dodecanese resort or the vibrant nightlife of Mykonos Town on your doorstep? The Greek islands offer so much, and we have the lowdown on the top hotels for the perfect gay honeymoon in Greece. Psarou Beach is close to Mykonos Town and it’s a major draw for the international jetset. As you make your way along the soft sands you’ll see luxury yachts moored on the dock. The famous Nammos restaurant is located on Psarou. You’ll see ladies with huge Louis Vuitton handbags wining and dining on the terrace. You never know who’s about to step off a yacht and unwind on one of the lavish sunbeds. It could be Lindsay Lohan or it could be you. The Kenshō Psarou opened just a few sandy footsteps from the beach in 2018. A-listers have been flocking there ever since. Narrow paths lead you through the white buildings. Lightly accented colours compliment Alekos Kolovos’ classic Grecian design, and give it a modern twist. Every angle of this hotel forms the perfect Instagram backdrop. All of the rooms come with a private plunge pool or Jacuzzi. The rooms are spacious, light, minimal and very chic. This hotel is the sister property of Kenshō Ornos, a five-star hotel perched on a hill above Ornos beach. Both hotels were designed for romance, making either Kenshō ideal for a gay honeymoon in Greece. All nine hotels of the Myconian Collection are stunning. The Myconian Naia is especially popular with Out Of Office travellers. It’s a 10-minute walk to Mykonos Town and a 10-minute drive to the party scene at Cavo Paradiso. Throughout the hotel there are glass windows revealing the whites and blues of the Aegean, as well as views of the island’s iconic windmills. Dotted along the pool are swings and love nests. At the state of the art spa you can unwind in the thalassotherapy pools. All of the suites have four poster beds, marble showers and terraces overlooking the sea. Some of the rooms come with infinity pools. This hotel is perfect for a Greek honeymoon. Mykonos Town is just a 10-minute walk, but you won’t want to leave the loveseats by the poolside. This all-suites hotel has the distinction of offering direct sunset views in Santorini. Indeed, it’s one of the only hotels on the island that can make such a claim. Each suite is a minimalist work of art. Charisma Suites embodies the unpretentious luxury Santorini does better than anywhere else. This dreamy setting is perfect for a honeymoon. The Honeymoon Suite comes with a private jacuzzi and direct views of the caldera. If you opt for a Pool Suite you’ll have your own plunge pool overlooking the Aegean. The staff will go out of their way to make sure you have the perfect experience. Don’t forget to try the “volcano” margarita at the bar. Charisma Suites is consistently one of the best-reviewed hotels in Santorini. This is one of Santorini’s sought after cave hotels. Canaves Oia was carved from caves on the cliffside that were once used to store wine by the Chaidemenos family. 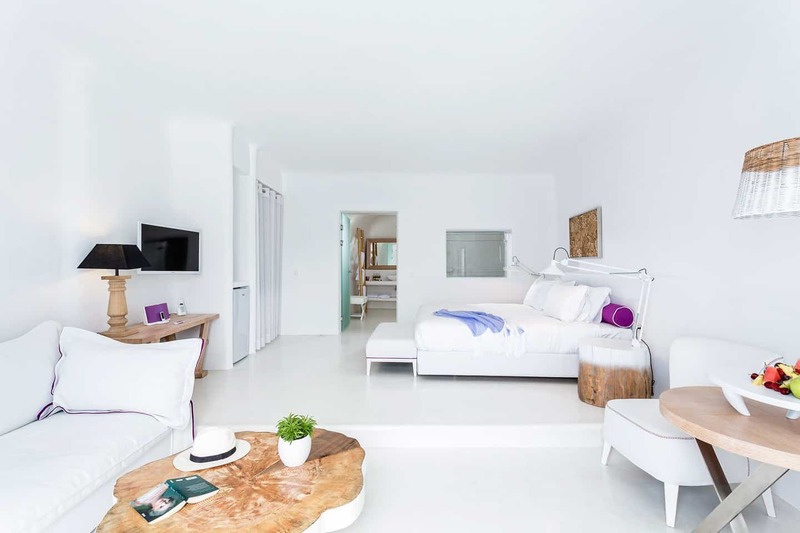 The luxury hotel that emerged in 1985 inaugurated the white and blue minimalist design tha’s so iconic in Santorini and beyond. The hotel stands in the shade of the blue domed church, the perfect backdrop for your gay honeymoon in Greece Instagram moment. You won’t need a filter. The location of the hotel is ideal. It’s right on the main pedestrian street in Oia. The design is a masterclass in understated elegance. Volcanic stone and baroque furnishings add a sense of drama. The infinity pool overlooks a small fishing village below. Luxury spa treatments are available in an atmospheric 17th-century cave. All of the suites come with private pools as well as direct views of Oia and the caldera – ideal for a Greek honeymoon. Set out over 60-acres, Lindian Village is a stunning resort in Rhodes. The pool is huge, there’s a private beach and four excellent restaurants. Half board options are available – a rarity for hotels in the Greek islands. This is ideal if you’d like all of the comforts of a resort for your gay honeymoon in Greece. An artificial river runs through the length of Lindian Village. The layout is excellent. Of the different room types and suites you could opt for the River-passage pool suites. They are very spacious and ideal for honeymoons. You’ll have your own garden and swimming pool – both of which are very private. The bathrooms offer double vanities, bathtubs and rain showers. A lot of resorts can be samey and lacking in elegance, but Lindian Village has the style you associate with the most romantic hotels in the Greek islands.